Freemasonry has been associated with the British discovery and settlement of Australia from the very beginning. Sir Joseph Banks (1743-1820), the naturalist who sailed into Botany Bay with James Cook in 1770 became a Freemason prior to 1768 and was a member of the Old Horn Lodge No. 4 in England. Thomas Lucas (1759-1815) a Private in the 23rd Company Marine Corps and a member of Lodge of temperance No 225 in England, arrived with the First Fleet. Captain Matthew Flinders (1774-1814) who arrived in 1795, was initiated into Friendly Cultivator Lodge while held in Mauritius. Thomas Prior (1756-1836), Robert William Felton Lathrop Murray (1777-1850) editor Colonial Times, Richard Fitzgerald (1772-1860), early proprietor of Bank of New South Wales, James Alexander Thomson (1805-1860), Architect, Engineer and Builder, Dr William Bland (1789-1868), Sydney’s first full-time private practitioner, Samuel Clayton (1783-1853) transported for forgery and engraved the banknotes for Bank New South Wales when it opened its doors in 1817 and Francis Greenway (1777-1837) colonial architect appeared on the old $10 note. In September 1802, two French naval vessels, Le Geographe and Le Naturaliste, were anchored in Port Jackson and whilst there held a lodge meeting at which a Captain Anthony Fenn Kemp of the New South Wales Corps was initiated. It is interesting to note that Anthony Kemp was a Captain attached to the New South Wales Corps stationed at Port Jackson and therefore a senior officer of the Port Jackson battery. The war between France and England had ended only months before with the signing of the Treaty of Amiens on 21 March 1802 but these two French ships, on a scientific expedition under the control of Commodore Nicholas Baudin of the Le Geographe, had been sailing in Australian waters for nearly a year before they came into Sydney in June for replenishment stores. They did not sail again until November, so the crews had five months to fraternise with the settlers and the military personnel ashore. It is also recorded that Lodge Rameau d’Or d’Eleus (The Legend of the Golden Acacia) was formed by French gold miners at Ballarat (Victoria) in 1856 and that it had applied for recognition by the English Constitution lodge already in existence in the same town. Recently (1992) a French language lodge was constituted in Sydney. Sir Henry Browne Hayes (1762-1832), an Irish convict, attempted to form a Lodge in 1803 in defiance of an order from Governor King, however, his meeting held on 14th May 1803 is regarded as the foundation day of Freemasonry in Australia. He did not try again even though he later formed a friendship with Lachlan Macquarie, the first of many Governors to be members of the Masonic fraternity. It was common practice at this time for Masonic Lodges to be formed on board naval vessels and within regiments of the British Army and for Freemasonry to be practiced wherever the ship or regiment was stationed. The 46th Regiment of Foot, which arrived in 1814, had attached to it the Lodge of Social and Military Virtues No. 227, Irish Constitution. The 48th Regiment with Lodge No. 218, Irish Constitution, replaced this regiment in 1817. It was this Lodge that granted dispensation to form the first Lodge in Sydney in 1820 at a time when the total population of the colony was only 30,000. This Lodge, with just twelve foundation members, was called the Australian Social Lodge and was issued with warrant No. 260 by the Grand Lodge of Ireland. The Lodge still meets in Sydney as Lodge Antiquity No. 1 on the register of the United Grand Lodge of New South Wales and the Australian Capital Territory. This, in turn, led the Freemasons to seek local control of their Masonic affairs, which resulted in a number of attempts to form local Grand Lodges independent from the parent bodies in Britain. 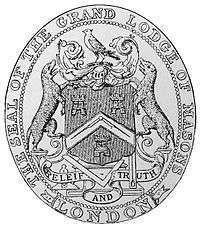 The Grand Lodges of England, Ireland and Scotland in particular, strenuously opposed such a move and it was not until 1877 that mainly the Irish Lodges in the colony formed the Grand Lodge of New South Wales. The first Grand Master was the Hon. James Squire Farnell, at the time the Premier of New South Wales, who had previously been Provincial Grand Master for New South Wales of the Irish Constitution. There was a similar line of Masonic development in Victoria, which resulted in the establishment of the Grand Lodge of Victoria in 1883 with the Hon. George Selth Coppin, a Member of the Legislative Assembly, as the first Grand Master. Eventually, the other colonies each formed a Grand Lodge with South Australia leading in 1884, Tasmania in 1890, Western Australia in 1900 and Queensland in 1904. United Grand Lodges were established in New South Wales in 1888, Victoria in 1889 and Queensland in 1921.